The last reservation of this item will conclude on May 9. For rentals that require shipping or a pickup at a non-headquarter location, please select a later date for your arrival. Headquarter offices are the only locations that can accept a same-day reservation, as transit time is not calculated in this date. The Zeiss 21mm f/2.8 Distagon T* ZF.2 Lens for Nikon is a precision wide angle with accurate color rendering that produces professional high-contrast results. It is a manual focus only lens with a rugged metal build. It is ideal for landscapes, night sky photography, interiors, and for producing dramatic perspectives thanks to its relatively close 8.64" minimum focusing distance. It can be paired with both full frame sensor F mount cameras, such as the Nikon D810, and with crop frame sensor F mount cameras, such as the Nikon D7200. The focal length equivalent on crop frame sensors is 31.5mm. 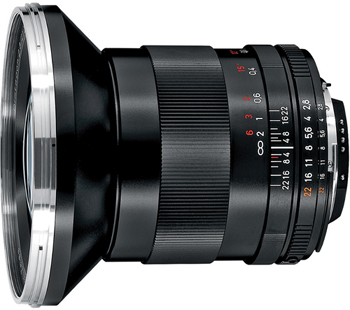 • This lens will mount on Nikon F mount crop sensor cameras in both full frame and crop frame sensors. The focal length equivalent on crop frame sensors is 31.5mm. • This lens has a mechanical lock on the aperture ring to keep it at its lowest setting and prevent unintentional adjustment while shooting. If you find yourself unable to manually adjust your aperture, please check to see if the lock is activated.